Dads Breakfast in Bed is a unique way to surprise Dad on Father's Day. Write a special message on his breakfast toast and tell him how much you love and appreciate him! 1. Mix 1 Tablespoon of milk with 4 drops of food coloring. 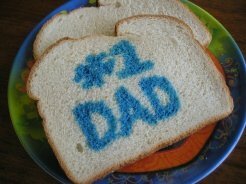 Dip your paint brush into the 'paint' and write or draw a special message to Dad right on the bread! Go ahead and toast your bread if you want, the color will stay true!